The ATEM 1 M/E Production Studio 4K is the Ultra HD 4K production switcher, allowing you to create stunning multi-camera live productions in a variety of formats including SD, HD and Ultra HD standards. 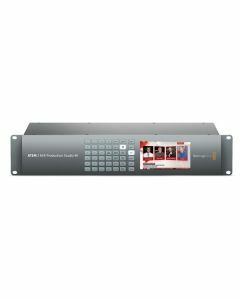 The ATEM 2 M/E features 20 6G-SDI inputs, DVE, SuperSource and more. Empowering you to create spectacular multi-camera live productions in a wide range of formats including SD, HD and Ultra HD standards, the Blackmagic Design ATEM 2 M/E Production Studio 4K is the Ultra HD 4K production switcher. The ATEM 2 M/E includes DVE, stingers, 20 6G-SDI inputs and SuperSource as well as being a portable solution, making it a solid, adaptable option for location and studio production work. It also features potent tools like chroma key, media pool, multi view, downstream keyers, creative transitions, an audio mixer and much more. Add to that the 4K capabilities of the ATEM and you've gone beyond broadcast quality, providing you with all the tools necessary for the most innovative live concerts, sporting events, theatre productions, conferences and more. It’s simple to switch the Blackmagic Design ATEM Production Studio 4K to Ultra HD for live events with super large high resolution screens, ensuring incredible quality. A great deal of live events now make use of these high resolution LED screens and projectors – the ATEM means it’s now possible to drive those screens in full resolution. The Blackmagic Design ATEM 2 M/E Production Studio 4K is as pleasant to look at as it is functional. Its front panel is made from elegant machined aluminium, with dedicated buttons for switching between auxiliary outputs. The built in video screen can act as technical monitoring to help during set up or to monitor auxiliary output. The optimum video and audio connections switch virtually all SD, 720p HD, 1080i HD, 1080p HD and Ultra HD formats, plus built in multi voltage power supplies so you can take your switcher anywhere. For demanding live production environments it’s possible to add a hardware based ATEM 2 M/E or 2 M/E Broadcast Panel featuring the highest quality buttons, knobs and faders for even faster switching. An SDK for custom control is also available. Only ATEM gives you such a wide range of control options. Full switcher control from any laptop or desktop computer is delivered with the included ATEM software control panel for both Mac and Windows. Before installing the software, we recommend that you run "Uninstall ATEM" first. NOTE: Please update the internal software in your ATEM Switcher and ATEM Broadcast Panel after installing this software. Simply connect the ATEM Switcher with a USB cable and run the included ATEM Setup Utility software. Then repeat for the ATEM Broadcast Panel. After this update, check your switcher chassis IP address in the ATEM Setup Utility. Please check www.blackmagicdesign.com for additional information on third party software compatibility and minimum system requirements.